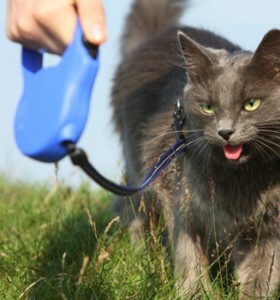 Cats on leashes – WWTD? Tonight,* the citizens of Concord, Massachusetts vote on whether or not troublemaking cats — cats who relieve themselves, eat birds, etc. while off-property — must be confined indoors or allowed outside only on-leash. It’s pretty mild as far as animal laws go: basically, if a neighbor doesn’t mind an owner’s cat on his or her property, no problem — but if they do create a nuisance and a neighbor complains and no solution is found, the owner would be required to keep them indoors or walk them on a leash outside. Pretty simple, really. The idea of a cat on a leash raises eyebrows for a lot of people, but a harness or leash on a cat isn’t really that uncommon. And even if the idea seems silly to you, a measure that seeks to address complaints without placing the burden on responsible pet owners most certainly is not. I'm. Going. To. Kill. You. But Lodynsky, who has owned felines in the past, said that it’s folly to consider a cat part of the natural world. Forget, for a moment, the debate over ever-more intrusive animal regulations, the debate over indoor vs. outdoor cats, and ask yourself: what would Thoreau do? * The vote was scheduled for Wednesday night, but there was not enough time to vote on the cat measure. Thoreau would probably sit on his front porch with a .22 and “discourage” cats from exploring the natural world. That being said, I don’t think people should shoot cats from their front porches (or anywhere) but it’s a dangerous world for a furry little animal like a cat and a really dangerous world for birds trying avoid becoming a meal/toy for said furry creatures. I keep my dogs from wandering the neighborhood eating and defecating in undesired ways and I expect my cat-owning neighbors to practice similar manners. I see no problem with cats being required to stay on their owner’s property. Cats can be on harnesses/leashes and you can build fences that contain cats (cats can’t get over 45 degree angles I believe). Not sure why so many cat owners seem to have the absurd notion that just because their cat can get over their fence that it is then okay to let it pester their neighbors. Birds and some pet reptiles cannot be contained with a fence, but that is no excuse to let them roam free, no matter how harmless to people they are. My mother’s roommate has cats, and it has always bugged me that she lets them outside to roam off the property when she knows the cats go into the neighbor’s yards to defecate. I caught one cat defecating right underneath one of their open windows! I’m afraid one day they’re going to bother someone who really does not like cats and will not make it home.